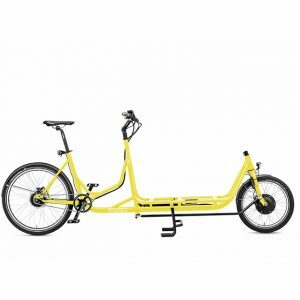 This bike will do everything a pedal powered cargo bike can do but easier. 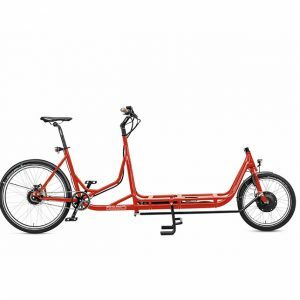 The Expedir revolutionises heavy hauling on a bike. eZee leads the way in providing you with a business or personal hauling vehicle that is easy on the ecosystem as it is on auto bills. 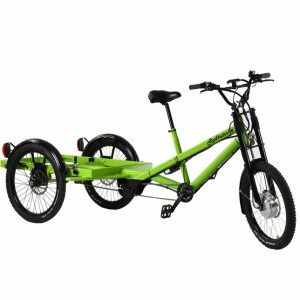 The Low Step Through design is a serious design bonus you won't find on other Long Tail cargo bikes and make mounting and dismounting easy even when carrying kids or cargo. The specially designed kickstand engages even with the payload and wheel skirts and running boards make carrying children easier and safer. The high torque motor powers the front while the rear Shimano Alfine gears change speedily and silently, ensuring an easy ride on any terrain. It's equipped with superb components from the best suppliers in the world. Schwalbe puncture-resistant tyres, Scandinavian spokes, 8-speed Shimano Alfine external gearing, Shimano disc brakes, front and rear LED lights, tough mudguards, a suspended Velo seat and a Cateye computer. Making it a very robust e-bike at the top of its game. Yes, it's still a bike but oh what a bike the Expedir is. 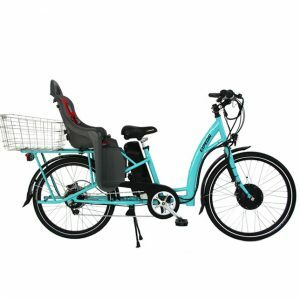 The eZee Expedir is likely the most popular family cargo bike in Sydney and is becoming very popular in Auckland too. Take the Expedir for a week long trial to see how straight forward it is to integrate into your lifestyle. The large front loading area at 83x50cm can easily be interchanged with various platforms, crates and tubs (not included). Make your own or upgrade to one in our range. Further add ons like our family package serves the safe and comfortable transportation of children, with options for for carrying 2 or 4 children with an addon rain cover to protect everyone in front so your family can ride all day everyday. 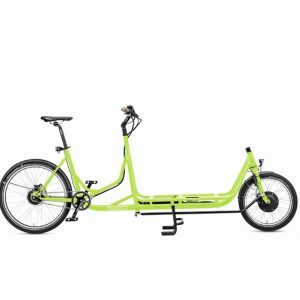 The Electric Rapid is equipped with a variant of the highly acclaimed eZee electric motor. It is not only convincing with its legendary torque (70Nm), but also through its low wear and tear consumption. 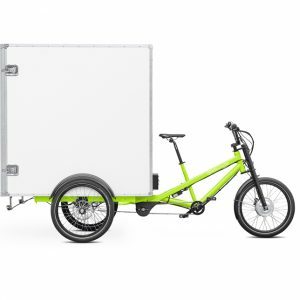 The battery compartment is integrated into the cargo area giving the Rapid a low centre of gravity and simple accessibility. The beauty of this battery is that it can be charged almost everywhere, is protected against cold in the winter and can also be operated with an exchange battery. Please note: Pictures may differ from our current stock. Please review the specifications below and get in touch for stock availability. The award winning Musketier offers a successful mixture of pleasant and environmentally friendly transport solutions for individuals or businesses. What is special about the Musketeer is its flexibility. With many different modular constructions available or the option to build your own. Whether it's a big family purchase or as a craftsman or to deliver goods, the Musketier brings your cargo from A to B. Or go further and create a business aligned with your passion. As a mobile coffee shop for example, or a mobile market stand. Are you a logistics company? 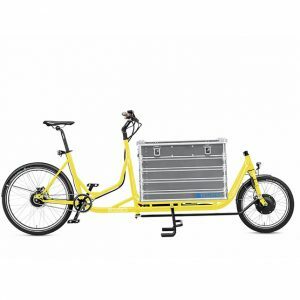 Now is the time to move your delivery sustainably. We have already carried out many experiments and are happy to realise your ideas with you. Let your imagination run free. 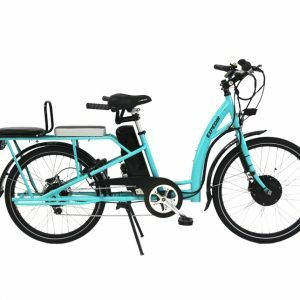 The Musketier is equipped with a variant of the highly acclaimed eZee electric motor. It is not only convincing with its legendary torque (70Nm), but also through its low wear and tear consumption. The battery compartment is integrated into the cargo area. The beauty of this battery is that it can be charged almost everywhere, is protected against cold in the winter and can also be operated with an exchange battery or upgraded to a larger option for covering more distance.